Kindness Chronicle | Sally Ember, Ed.D. 04/21/2015 by Sally Ember, Ed.D. Unfortunately, my life is somewhat fast-paced and my priorities are often elsewhere, so instead of actually reading these daily posts and clicking on their links, I stockpile them in a folder. Just knowing they are there gives me comfort, and since I also subscribe/ LIKE their public pages on Facebook, I often see some of the individual link posts, anyway. However, I mostly had no idea what actual uplifting stories are in this folder…until this week. So glad that I scheduled time to go through them to prepare this post. From this stuffed inbox of good news (not the Christian “Good News” kind), I share some of these inspiring anecdotes with you all. Enjoy! Subscribe! Do some good yourselves! Most of the posts are stories describing individuals or organizations who have made considerable (but not necessarily extraordinary, given how many of them there are, now) efforts to demonstrate gratitude, kindness, helpfulness, volunteerism, respect, support, encouragement and other forms of caring to humans, animals and the environment. So many of them are similar, with the main distinction being location rather than activity, I decided not to list them here. 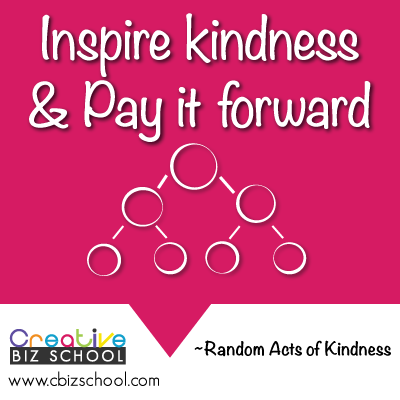 Please visit the above link, or the link below, for plenty of ideas, examples and even some research results on outcomes for “Paying it Forward,” teaching empathy and compassion, and other actions taken in the name of Kindness. The Elephant Journal is an online ‘zine and site that provides updates, information and opinion articles (warning: most of these are junk science, “New Age” garbage, and “affirmations” that aren’t worth reading) on a variety of topics related to living “a more mindful life.” This open-ended mandate allows The Elephant Journal to surprise me often with their choices of topics, perspectives and data. TEJ‘s pieces include multimedia formats that can feature humor, health, relationships, nutrition info/recipes, politics and edgy/radical points of view (with the aforementioned exceptions), pulled from a diverse group of commentators. I don’t always agree with or even like what is posted, but I appreciate the range of opinions, which can veer way over to “totally ‘woo-woo,’ New-Age junk science” to well-researched, documented, data-filled info pieces. I appreciate this compilation enormously and respect the people who work there and write/ create/ collate/ curate for TEJ a lot. TEJ also posts excellent images (photographs, logos, infographics, memes) that are inspiring, beautiful and informative separately or to accompany an article. Here are some of my favorite recent examples of their offerings, which arrive in emails entitled: “A Daily Gap in the Inbox of Your Mind,” steered by Waylon Lewis, editor-in-chief, host of Walk the Talk Show. Most tellingly, he starts with this subtitle: “I am sorry I loved you so badly.” I have a list of people I should say this to….Sigh. Life is hard, sometimes. Sometimes it’s rich and dear. If we want to take it easy, we should instead wish to be stronger, and more vulnerable. May our love life be as full of grace as our spiritual path, our right livelihood, and our friendships and family relationships. True love is defined by correct intention. My email program just informed me: “Your ‘Kindness and Good Deeds’ folder is now empty.” I’m glad to know it will surely be filling up again.